If you visit Venice, you just must take a ride in a gondola. Below, I will give you the why, when, where, how and who of putting together your romantic gondola ride. I will intersperse photos of our own romantic gondola rides throughout. To visit Venice without taking a ride in a gondola is like not visiting Venice at all. 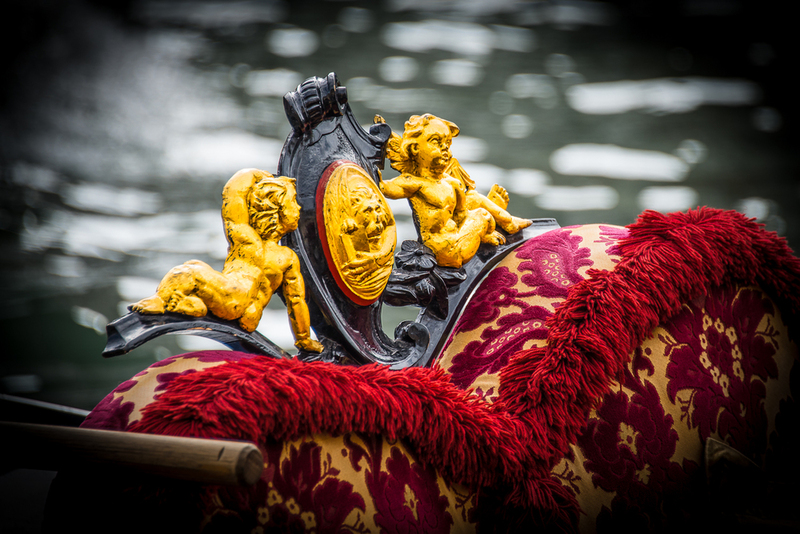 A gondola ride in Venice is the quintessential experience, as the gondola is THE Venetian icon. The gondola is a traditional flat-bottomed boat that is rowed by a gondolier. The rowing oar is not actually attached to the gondola, but is rested on the forcula like the one at right. The gondolier uses some elaborate sequence of strokes to propel the gondola. You can watch a gondolier for hours and not get a good feel for how they move and turn their gondola. It is one of those mysteries of Venetian life. 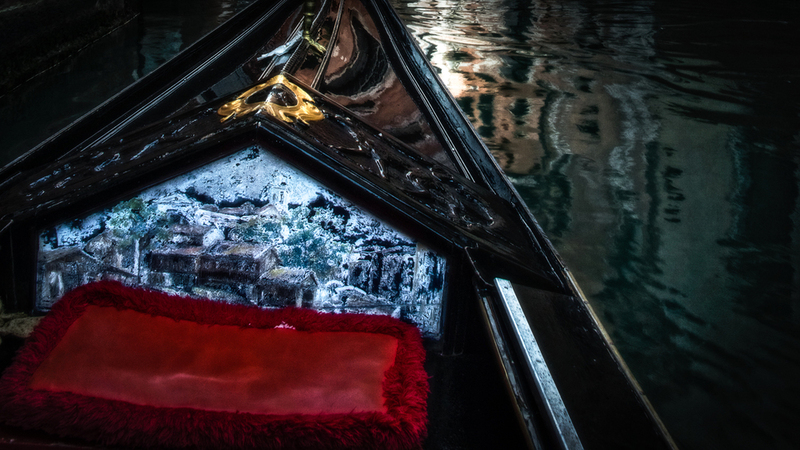 Every gondola is different, and each is a work of art. 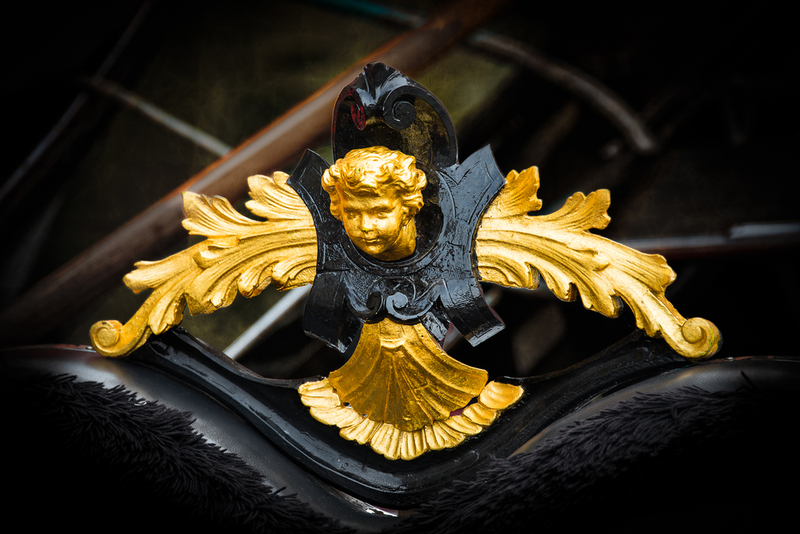 The embellishments are unique to the gondolier. My opinion: it makes a difference as to what time of day you take your gondola ride. Take your ride during the day, and it is a gondola ride. Take your ride in the evening, and it is a romantic gondola ride. We have chosen our gondola ride times based on sunset times. Since a typical ride is about 50 minutes, plan the start of your time so that sunset occurs near the midpoint of your ride. Another factor concerning the time of day is the amount of boat traffic and the crowds. It seems that the population of Venice during the day is close to twice that of the night. Many of the visitors to Venice are there just for the day...they stay on the mainland and arrive by tour bus. Boat traffic on the Grand Canal is more prolific due to these visitors, as well as needs to supply the town with goods. This means that after five o'clock, things get much, much quieter in Venice. Now Venice is yours to enjoy. Now, it is time for that gondola ride. There are numerous starting points for gondola rides within Venice, but here is our favorite. There is a gondola station at the Campo Moise, near the entrance to the Hotel Bauer, just west of Piazza San Marco. The benefit of this starting location is that you get to wander some very picturesque narrow canals before entering the Grand Canal. And your entrance point to the Grand Canal soon brings you to the famous Rialto Bridge, under which you will pass. 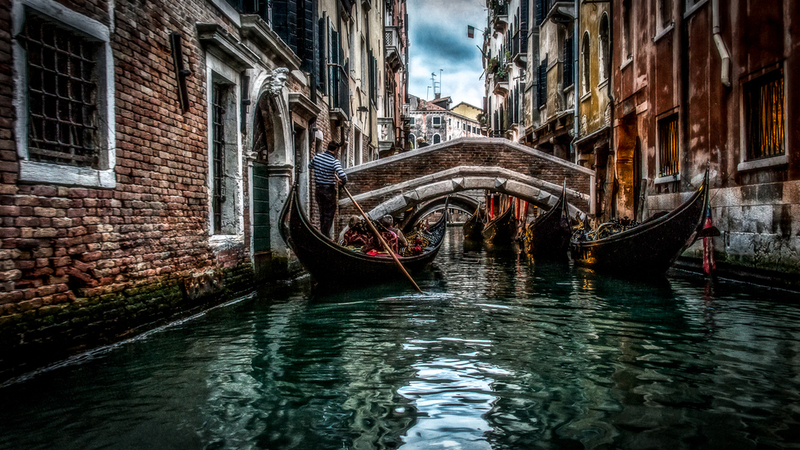 Then your gondolier will take you through a maze of narrow canals to the essential Bridge of Sighs. Since passing under the Bridge of Sighs is essential, be sure to confirm with your gondolier before your departure that you route will take you there. Passing under this bridge is essential because it is a known fact that if you kiss your loved one as you pass under the Bridge of Sighs, you will be sure to return to Venice. Then, it is just a short ride back out to the Grand Canal where you will cruise past the Molo and then to the end your ride, right back where you started. A side note: if you stay at the Hotel Flora (see my article on the Hotel Flora here), you will be just a few steps away from this gondola station. Gondola rides in the evening are very popular. I would suggest that you drop by the gondola station during the day to make a reservation and to establish a starting time. The price? Does it really matter? I would suggest taking your romantic gondola ride with the one you love. That’s what I do! When you take your own romantic gondola ride, I would love to be your gondolier.